Navan's name comes from Navana, a small village on the north-eastern coast of Madagascar, one of the island's most renowned vanilla-producing regions. 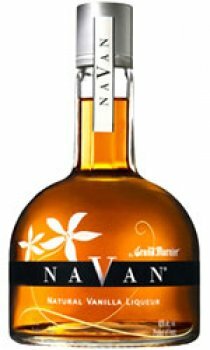 Navan is the association of natural vanilla from Madagascar with fine French cognacs. Navan continues the House of Grand Marnier's passion for combining cognac with pure, natural flavours. It is a 40% alc/vol liqueur, an ideal balance between the complexity of cognac and the smoothness of natural vanilla. Nava can be enjoyed straight up, on the rocks, or in delicious cocktails. We recently discovered this wonderful product. It is wonderfully smooth and goes with anything. Personally I had never come across this brandy before visiting the USA. In fact, most retailers will look at you with a puzzled expression if you ask for it! That's a shame, as this is truly fantastic and well worth hunting down. Open the uniquely shaped bottle and you're instantly hit with a wonderful sweet aroma of vanilla...the brandy itself is equally delicious, with a smooth and delicate finish. Try it, and you won't be disappointed. I'm a convert!